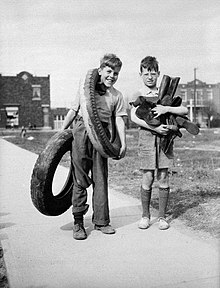 Two boys in Montreal in April, 1942 collect rubber tires and boots to be recycled as part of Canada's war effort. In 1981 Resource Integration Systems (RIS) in collaboration with Laidlaw International tested the first blue box recycling system on 1500 homes in Kitchener, Ontario. Due to the success of the project the City of Kitchener put out a contract for public bid in 1984 for a recycling system citywide. Laidlaw won the bid and continued with the popular blue box recycling system. Today hundreds of cities around the world use the blue box system or a similar variation. In Alberta, the Alberta Recycling Management Authority (also known as "Alberta Recycling") is an arms-length body set up by the Government of Alberta under the Ministry of the Environment to coordinate recycling in the province. It administers the surcharge that has been added to the price of electronics, paint, and tires sold in the province since 2005 to pay for the recycling of those products in Alberta, and it helps to administer the province's household hazardous waste disposal program. A separate management authority, the Beverage Container Management Board (BCMB), is responsible for recycling of beverage containers. Beverage container recycling regulations were first introduced province-wide in 1972, but the BCMB was created in 1997 to create a provincial oversight body for the industry. The BCMB oversees two non-profit corporations which process the materials, the Alberta Beer Container Corporation (ABCC) for standard-sized beer bottles (which reuses rather than recycles the bottles) and the Alberta Beverage Container Recycling Corporation (ABCRC) for all other beverage containers. Containers are actually collected at privately owned, for-profit bottle depots. As of 2011[update] there are over 200 such bottle depots in Alberta, which are members of the Alberta Bottle Depot Association. The Recycling Council of Alberta is a registered charity which has promoted recycling in Alberta since 1987. Specific industry groups lobby for their niche within the recycling sector, such as the Alberta Plastics Recycling Association. Curbside recycling of newsprint, cardboard, plastic packaging, and other non-food household wastes is the responsibility of the individual municipalities of Alberta. Most of Alberta's most populous municipalities have blue box, blue bag, or blue bin recycling container programs. The two largest municipalities, however, adopted waste-diverting policies at a very different pace. Edmonton began a pilot project in curbside recycling for single-family houses in 1986 and adopted it citywide in 1988, expanding over the years to include more items (Christmas trees in 1990, and construction waste in 2008), and higher levels of processing including large-scale composting and capturing methane to produce energy. In addition, the scope of collection has expanded to include multifamily buildings in 2001 and businesses in 2010. It is expected that when the waste-to-biofuel plant is completed in 2012, Edmonton will divert 90% of its waste from landfills. By contrast Calgary conducted a pilot project on curbside recycling in 1991 and then abandoned curbside collection for a drop-off system until a second pilot program in 2004, and currently collects recyclates only at private houses, with no plans to introduce collection at condo and apartment buildings before 2015. These three differently-coloured bins are used to sort waste in Toronto. A bottle-picker in Kelowna, BC in 2010. ^ McGinnis, J., Findlay, R., Rathbone, G., Shantora, V., &Oliver, B. (n.d.). The blue box story, the history. Retrieved from "Archived copy". Archived from the original on 2013-08-02. Retrieved 2013-07-29. CS1 maint: Archived copy as title (link); O'Connor, Ryan. (2015). The First Green Wave: Pollution Probe and the Origins of Environmental Activism in Ontario. Vancouver, BC: UBC Press. ^ Alberta Recycling Management Authority – Vision, Mission & Goals. Albertarecycling.ca. Retrieved on 2011-04-02. ^ I want to recycle my... – Alberta Environment. Environment.alberta.ca (2010-04-16). Retrieved on 2011-04-02. ^ About ABCRC. Abcrc.com. Retrieved on 2011-04-02. ^ Welcome to the Recycling Council of Alberta – Mission and Goals. Recycle.ab.ca. Retrieved on 2011-04-02. ^ APRA. Recycleyourplastic.ca. Retrieved on 2011-04-02. ^ History of Waste Management in Edmonton, City of Edmonton. Retrieved on 2011-04-02. ^ Calgary's Recycling History, The City of Calgary. Retrieved on 2011-04-02. ^ Cuthbertson, Richard. 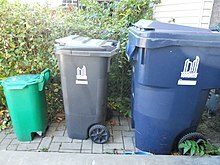 (2011-03-08) Calgary condo residents must wait until 2015 for recycling program. Calgary Herald. Retrieved on 2011-04-02. This page was last edited on 26 January 2019, at 23:49 (UTC).